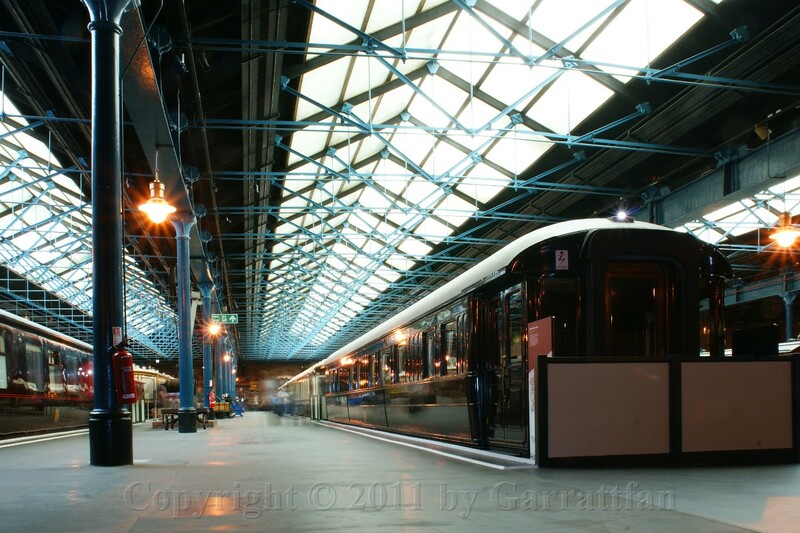 On our 2011 holiday in the UK I paid a visit to the National Railway Museum in York. For a second time actually, I was here in 2009 too, but I simply could not resist a revisit. 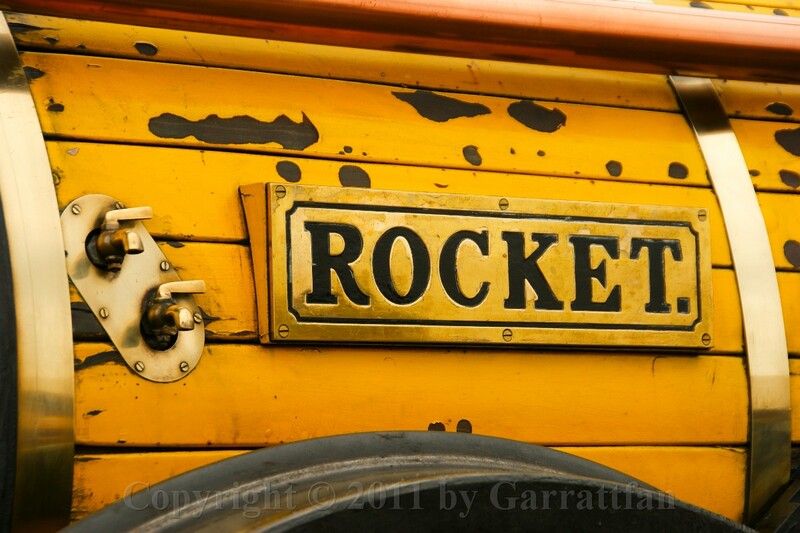 1 I found this replica of Stephenson's Rocket in steam outside. 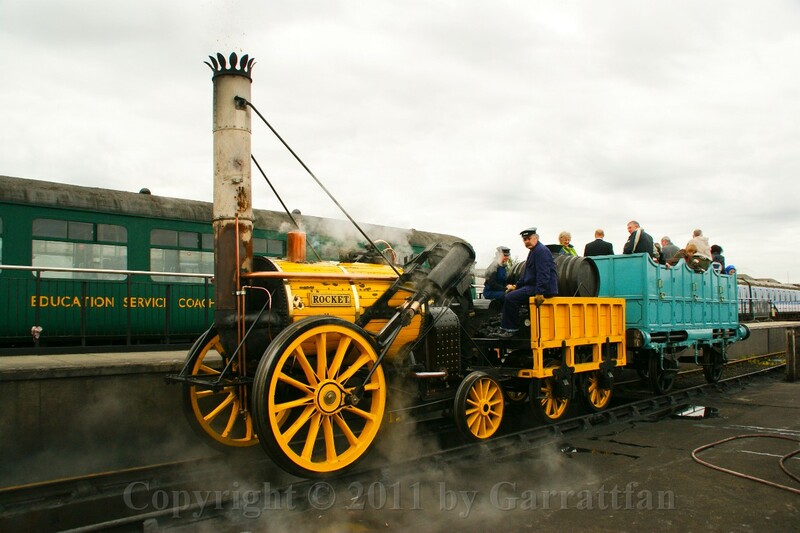 The original locomotive was winner of the Rainhill trials. 2 The Rainhill Trials were an important competition in the early days of steam locomotive railways, run in October 1829 for the nearly completed Liverpool and Manchester Railway. Five engines competed, running back and forth along a mile length of level track at Rainhill, in Lancashire (now Merseyside). 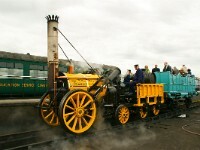 Stephenson's Rocket was the only locomotive to complete the trials, and was declared the winner. The Stephensons were accordingly given the contract to produce locomotives for the railway. 6 2. 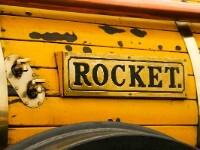 Rocket used a blastpipe, feeding the exhaust steam from the cylinders into the base of the chimney to create an artificial draught through the boiler. 7 3.Previous designs had the cylinders positioned vertically, which gave the engines a swaying motion Rocket had the cylinders set closer to horizontal. 9 5. The firebox was separate from the boiler and was double walled, with a water jacket between them. This way the hottest part of the boiler was surrounded by water, the most effective way of turning water into steam. 14 A view on the valve gear, which sets the timing of the steam admission to and release from the cylinders. 20 5000 was built at Crewe in 1935 for the London Midlans Scotland Railway. After withdrawal 1967, 5000 was selected to represent its 842-strong class as part of the National Railway Collection. However, it is now a static exhibit. 23 Great Western Railway 2-8-0 heavy freight locomotive 2818 built in Swindon 1905 to a design by J. G. Churchward. 84 were produced. In 1948 one of the 2800 class competed remarkably successfully against more modern engines like the LMS 8F and the WD Austerity 2-8-0 and WD Austerity 2-10-0. They worked until as late as 1965. Six engines are still with us today. 25 Now what is this?? 27 I don't look very happy but believe me, I am!! 34 Beauty is in the eye of the beholder. Personally I consider this locomotive odd-looking for its inside bearing on the tender wheels and the failing leading carrying axle on the front of the locomotive. But it has undeniably a certain design quality about it. Designed by Stroudley and built in 1878 this was the first of a class of 36 express locomotives. The absence of a leading carrying axle must have made them rough riders at high speeds and curves. Yet the last of them saw service until 1933. 37 I was a bit disappointed to find the loco here. We had visited Chartwell, Churchill's house, and it seemed fitting to me to make a good deal of photos of this loco. 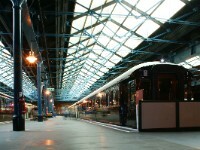 43 The Duchess of Hamilton, a survivor of the Coronation class, returned on display in its original streamlined casing. 44 In the 1930's streamlining came in vogue. Almost everything was streamlined, up to the vacuum cleaners in the households. Between 1935 and 1940 most railways surrendered to experimenting with streamline casing. "Surrendered" I say because there was considerable pressure from press, public and competitors to clad high speeds express locomotives in a steel shroud. It was a short lived frenzy. With the advent of war speeds went down, focus shifted to maintainability rather then fuel efficiency, and with speeds down the latter was less of a factor anyway. 49 Evening Star, appropriately named so as it was the last steam locomotive delivered to the British Railways in 1960. Only eight years later the last steam locomotive of BR extinguished its fire for ever. Eight years in which many good and reasonably young steam engines were send to the scrapyard in a surge and search for modernisation at the same time however laying a huge burden on future investments. The influx of an incredible amount diesel engines within a few years was first not without its teething problems and second meant that thirty years later all these engines were due for replacement all at the same time. 52 I still don't look very happy. do I? 53 As I said, beauty is in the eye of the beholder. In this case the beholder must be blind to miss the fact that this thing is downright ugly. The Austerity Q1 class, built in 1942, was designed as a wartime economy locomotive by Bulleid, making use of already existing patterns for many of their parts, as goods locomotives intended only for a short life. Although the same weight as the Q-class, their predecessors, they were 50 per-cent more powerful, and proved to be fine machines, lasting until 1966, much longer than originally intended.